The Touratech Suspension DDA / Plug & Travel suspension set is an absolutely top class suspension system for your BMW R 1200 GS equipped with the BMW DDC system. 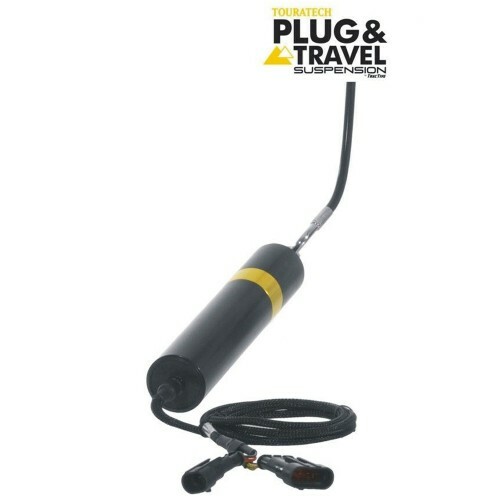 This premium suspension system is systematically designed for long-distance touring with lots of luggage, on any type of road surface and even off-road. 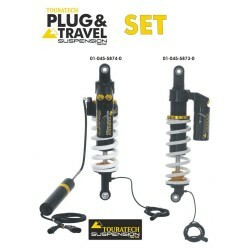 Touratech Suspension DDA / Plug & Travel shock absorbers simply replace the BMW DDC shocks. The existing plug connectors and switches on the handlebar are retained and used as usual. As a result, the Touratech suspension system becomes an integral part of the motorcycle via the original BMW control unit. You can continue to use the various riding mode and load setting configurations on the BMW display. The Touratech suspension system that adapts itself to the adventurer inside you so all you have to do is ride!